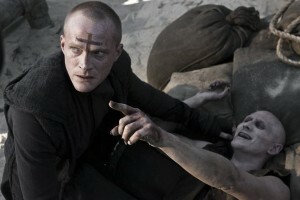 Paul Bettany (l.) takes care of business involving the undead in Priest. Sony Pictures Home Entertainment released an unrated edition of the action horror movie Priest on Aug. 16, 2011, on Blu-ray and Blu-ray 3D, along with a DVD edition of the PG-13-rated theatrical version. The Blu-ray 3D is priced at $45.99; the Blu-ray carries a list price of $35.99 and the DVD lists at $30.99. This effects-and-action-filled movie stars Paul Bettany (Creation), Cam Gigandet (Easy A) and Maggie Q (TV’s Nikita) as rogue warriors on a mission to rescue a beautiful young woman (Lily Collins, The Blind Side) from a priest-turned-vampire (Karl Urban, And Soon the Darkness) who’s bent on destroying humanity.